A very interesting essay. I’ve kept commonplace books for about four years now (though I’ve only just learned what they’re called) and though I use them to write my own observations/story ideas they are mostly filled with quotations from books. I’ll admit that sometimes when I am copying down a particularly great passage it occurs to me how great it would be to be able to orate it from memory in the midst of some impossible argument or ecstatic occasion. Unfortunately, my life is nothing like a Joyce novel, and I do not have witty exchanges with literary fellows in which to do so. Instead, they serve as reminders for my already crippled memory so that I may relive books I read long ago. Tumblr, on the other hand, does not impress me precisely because of the lack of original content. 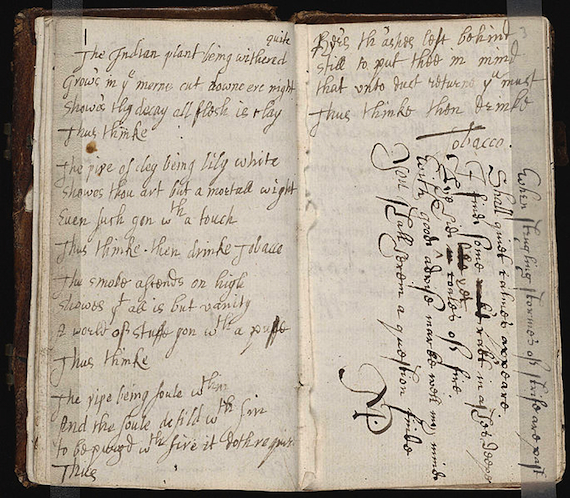 I should doubt one would enjoy another’s commonplace book as much as one’s own. With respect to your historical analysis of the commonplace book, and while I agree that the thing bears some similarity to an amalgamation of reblogs (or Pinterest, or some Twitter and Facebook accounts, or a great deal of things on the web), I believe your estimation of Tumblr is a bit narrow, Shaj. Yes, of Tumblr’s 46 million accounts, there are certainly a lot of ones dedicated to cats, memes, and cat memes, but there are also admirable ones like those of Kateoplis*, Shortform, SoupSoup, and AZSpot (to name just the first four examples I encountered on The Millions’ dashboard right now). While these blogs aren’t dedicated to original content — you are correct to say those that do are the minority — they do offer guided, directed content with a particular bent and, often, commentary or analysis to accompany it. *Note: This one’s pretty “unspecialized,” and Kate’s not a celebrity in real life, but I believe her follower count numbers in the 400,000s, not “effectively none,” as you write above. But as to that minority of original content on Tumblr, I have to point out that that’s there, too, if you only look in the right places. The Millions posts its “#LitBeat” articles on Tumblr; people like Annamarie Tendler post “daily face” makeup tips; n+1 runs their personal ads on the site; the University of Texas’ Harry Ransom Center has a Tumblr so they can share their archives with people located outside of Austin; the LA Review of Books (until about a month from now) has existed entirely on Tumblr. I also feel like your distinction between original v. unoriginal is a little too rigid. Whose to say that Slaughterhouse 90210’s re-purposed images and passages isn’t original content? Or that Better Book Titles’ site isn’t original content? Couldn’t it be argued that the entire act of curating, in and of itself, amounts to an original creation? Put another way: my bookmarks don’t look like your bookmarks, but we could probably learn a good deal from one another if we look at each other’s. Again, I can see the parallels you draw, and I agree with a lot of them, but I also think your sample size upon which you appear to judge all of Tumblr was a bit small. Certainly your vision of Tumblr as a commonplace book is loftier and more profound than mine was, but I’ve long thought that Tumblr was a great place to compile knowledge in a commonplace-esque way. Great essay. A wonderful Commonplace Book (in an even more wonderful magazine) is the feature that runs in the back of The American Scholar every issue. Each one is on some evocative theme (Mercy, Fear, Grief, Debt, etc.) and they are like little poems or collages, beautifully wrought and unexpected. The original content in Tumblr is not the individual quotes, photos, etc. It’s the sum of these things, a reflection of the preoccupations of their curator, which is original. I can’t speak for others but my purpose in keeping a “commonplace book” is to keep a kind of running dialogue with other writers and thinkers who express some insight we share. So that when I’m rummaging in my book I can see patterns emerge that would otherwise not be seen at all, or only at a distance. It’s worth pointing out that in commonplacing Grafton’s essay, you leave out its central topic: it’s about Francis Daniel Pastorius, founder of Germantown and early Philly settler, who kept a massive commonplace book called ‘The Bee-Hive’ between 1696 – 1719. As a writer based in Philadelphia, you should check it out sometime, it’s great! If you pay attention to Pastorius’ methods of organization within his commonplace book (get in touch with me if you want descriptions of it), you’ll find there are aspects of it that would allow you to draw your comparison outside of, as others say, a very narrow approach. But more importantly, looking at the actual topic of Grafton’s essay gets to another point that departs from the commonplace tradition: community. Pastorius writes in the opening pages of the book that he wants his sons and heirs to add their own commonplaces to it, and elsewhere throughout the book the idea expands to the whole of colonial Philadelphia, as a communal resource. But it doesn’t happen. No one reblogs Pastorius, let alone adds to his idea, in spite of the fact that he is a schoolmaster, judge, and lawmaker, deeply involved in city life. That’s exactly the kind of failure that doesn’t gel with the statistics you’re giving us here. Because digital appropriation is lately concerned not so much with what is appropriated (cat memes included), but the means by which we appropriate it. You’re talking about millions of users, and the commonplace tradition typically deals with one person’s private archives. Pastorius is one of the earliest examples of attempted transition from singular to communal appropriation, but his limitations of time and material are crucial obstacles to both his ambition, and now your comparison.